For those without comedic tastes, the so-called experts at Wikipedia have an article about Orion. Orion, pictured here, holding curvy thing with fist extended in air. It is unknown why Orion's fist is in the air, but there are theories. According to Mrs. Irving, "Maybe he's a golfer and just sunk a putt with the curvy thing, and he's celebrating by putting his fist in the air!" Orion is a prominent constellation in the night sky. According to ancient writings, Orion was apparently joined in the night sky by 87 other constellations at one time. 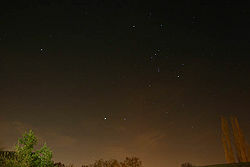 However, according to professional astronomers Lionel and Linda Irving, Orion is one of only "6 or 7" in the sky today. The name "Orion" refers to "some dead Greek hunter or something" in Linda's words. Orion is notable for it's conspicuous location, which is "right there—next to that cell tower there," in the words of Lionel Irving. Orion is notable for having a "big belty thing" near its center, according to Linda. Below that, scientists using the latest in magnification technology, such as a set of $10.00 binoculars from the drug store, have recently detected that there is a very faint "sort of smudge. No, that might just be something on my binoculars,'" said the accomplished Mr. Irving, wiping off the lens with his Mötley Crüe T-Shirt. There is also a red star which, in the words of Linda Irving, "is named Betelgeuse after that movie from a while back. You know what, Lionel? We oughta watch that again." If one draws a line diagonally "that way, towards the forest, with your finger in the sky," one will see the blue-white star "Riggle, or Rye-jel, or something like that," as said by the knowledgeable Lionel. In the night sky, it forms the shape of some guy holding some sort of curvy piece of paper with his fist extended in the air. Betelgeuse sometimes isn't considered a star. It is a red space object in Orion's right shoulder, and the Irvings believe it could blow up "any second by now." It is only famous because it was named after a movie. Riggle is another giant object. It is located in Orion's left foot, and is the sixth brightest star in the sky alltogether. Um, Irving doesn't have anything else to say. Bellatrix has many different names, such as "Gamma Orionis" and "Amazon Star", but many scientists refer to it as Bellatrix because it's "the coolest [of the names]," according to astronomer Lionel Irving. It is the twenty-second brightest star in the night sky. It is located in Orion's left shoulder, and, according to Irving, is going to explode into a supernova, whatever that is. Mintaka, also known as "Delta Orionis", is one of the three stars in Orion's belt. It is a white star. Mintaka is the star on the right side of Orion's Belt. Alnilam was named "Epsilon Orionis," because "I dunno, maybe the stars going from north to south are named alphabetically." Alnilam is a blue space object, and is between Mintaka and Alnitak, the other two stars in Orion's belt. Alnilam is getting lighter and lighter, and it will eventually be as light as "that skeleton that was found around the block from here in 2005." All-Intact is a star in Orion's belt, and it is the star that is on the left side. It is "around 800 miles from our Sun", and is another blue space object. Saiph is a star in Orion's right foot, and it is the faintest star in Orion. It only exists theoretically, as some astronomers say they cannot see it, as it is blocked by "that traffic pole," in the words of legendary astronomer Linda Irving. Irving estimated that it could be 46,000°F on the surface of it. That's Scorpio? That's the scorpion that attacked Orion? What a wuss. The way Orion looked in the 1800's. Apparently, the sky had more color then, and he had a river growing out of his foot. The mythos of Orion is well-known. Scientists such as Linda Irving,who is known for her credentials such as a BS from ITT Technical Institute, and her husband Lionel, have scoured the most accurate of scholarly sources and "really know [their] stuff", according to Lionel. According to the ancient Greeks, Orion was "some Hunter guy who killed a bunch of stuff". Then, one of these days some random scorpion apparently stung him "right in the kisser" and Orion kicked the bucket. So the Greeks decided to throw this no-name and the stupid scorpion that killed him up in the sky. Why they decided to do this is "completely beyond [us]," in the words of the ever-knowledgeable Linda Irving. However, the current location of the scorpion, called "Scorpio", baffles even modern scientists. When inquired, noted stargazer Lionel Irving "What, like the zodiac sign? Well, I don't see anything Scorpion-like in the sky at all! There's the big dipper, and the W-thingy and that that really bright thing over there." These discoveries were heralded by modern scientists, who formerly inferred that it was named after that movie company. 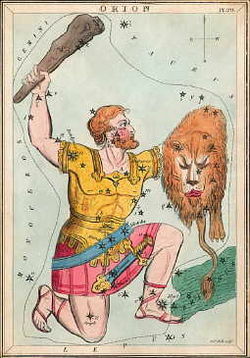 In other cultures, Orion does not take the form of "some hunter guy", but almost always exists as a constellation due to its "nifty location" (Irving). Today, the way these other cultures interpreted the stars is not known well. Of course, several knowledgeable persons, such as the Irvings, continue to make inferences. For example, Linda Irving speculates the Australian Aborigines saw "I dunno, a can of Vegemite or Mad Max or something like that." In addition, Mr. Irving suggests that the Arabs saw "maybe a hookah." However, that isn't important because "the Arabs and Africans never do anything that actually impacts the world," in the words of the knowledgeable and talented Mr. Irving. Looks familiar, doesn't it? 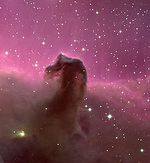 That's because this is the Horsehead Nebula. The dust, clouds, and newborn stars makes it take a form of a horse. Just below the star Alnitak, "You get a real treat". It's the Horsehead Nebula, a dark nebula that is "Obviously shaped like a horse, and there is no other animal it could be", according to Linda Irving. It is 1,500 miles from Earth, and the shape was first noticed in 1888 by Williamina Fleming. The Irvings believed that "If Orion was a hunter, he must have hunted a horse sometime in his life", and that was a statement that was agreed with most people. Unfortunately, many scientists are unable to see the Horsehead Nebula, due to an as-of-now unexplained glow that takes up most of the sky. However, Scientist Linda Irving thinks "It's okay, there are better things to look at. For example, look at the beautiful city skyline over there! Look at how bright the buildings are!" If you are one of the lucky few who can see it and look at it closely, you can see "Some sort of red glow caused by another star from a different constellation, and the star is called Sigma Orionis or other." The darkness is caused by a thick layer of dust, and its gas burns up and form a powerful magnetic field, giving the nebula a horse head. It is dark, and the bright spots are just new stars "That are going to be born", according to Lionel. ↑ Or is it Rye-jel? ↑ Was that spelled right? It might have been named "Alnitak". ↑ For example, in Egypt, they called Orion "Ossyrus" or something like that. ↑ "Buildings are more important, you know!" Irving, Lionel and Irving, Linda. "2009 Summer Beers & Barbeque at the Beach". 16 July 2009, Documented by $170 Sony Camera. Balseberry, Wanda et. al. "The Children's Guide to the Stars". 2003. Random House, New York. Michaels, Nick. "Horsehead Nebula for Morons". 2005. Puffington Books, California. This page was last edited on 29 August 2012, at 02:29.